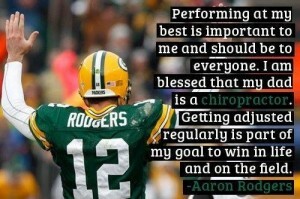 Why 90% of Elite Athletes Use Chiropractic RegularlyFACT: Chiropractic care improves human function and performance. The power of an adjustment maximizes the human body’s innate potential in all men and women. Chiropractic delivers results to everyone from infants and children improving growth and coordination to athletes seeking a physical edge. When someone asks me if chiropractic could help with their problem, the answer is always yes. While chiropractic is not a cure for any condition, it serves to enhance the inner workings of your body so that your body works better. The hype surrounding the benefits of Chiropractic care for athletes began spreading over two decades ago. Many of the world’s most elite athletes began going so far as to hire Chiropractors to accompany travel to competitions. Athletes sought the Chiropractic edge before, during, and after competition. Not only do Chiropractic adjustments maximize performance and prevent injury, but many athletes also notice significant improvements in recovery following workouts and competitions. Nearly every professional sports team employs a Chiropractor on staff to deliver adjustments on a regular basis. All athletes participating in a physically-demanding activity will benefit from Chiropractic care, but the advantages go far beyond simply overcoming or preventing pain and injury. Increasing performance continues to be the goal of all competitors. Chiropractic delivers significant results through unique spinal adjustments that cannot be replicated nor found through any other means. A 2015 study showed that athletes receiving spinal adjustments to the pelvis significantly increased their vertical jump height. The study tested 30 female college athletes, all whom had a 10mm or more difference in leg length between their left and right legs. The group split into two groups of fifteen subjects. One group received three to five pelvic adjustments. The other group was given a specific muscular stretching and postural heightening protocol designed to loosen the muscles in and around the pelvis. The study concluded with vertical jump height improving an average of 3.6cm in the group receiving Chiropractic adjustments. No significant change in vertical jump took place in the stretching group. All subjects participating in the study were asymptomatic. A lack of symptoms continues to prove inconsequential in determining the presence of spinal or pelvic misalignment. Vertebral subluxation can exist and cause diminished performance without any pain or symptoms.